Due to the 516 MB file size and limited time trial, broadband connection is recommended. To bypass downloading, add the backup CD to your order to receive it by mail. All's not well in Blackmoor Manor, a 14th Century English mansion haunted by a tragic past. As Nancy Drew, you embark on your first international adventure to visit Linda Penvellyn, your neighbor's daughter and newlywed wife of a British diplomat. A mysterious malady keeps Linda hidden behind thick bed curtains. Is she hiding from someone, or is a more menacing threat stalking her? 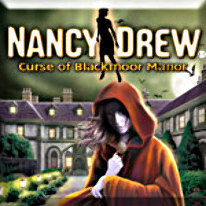 Nancy Drew: Curse of Blackmoor Manor puts players in the shoes of teenage super-sleuth Nancy Drew as she investigates a string of mysterious events at spooky Blackmoor Manor.